TRASH Arts are a provider of junk-percussion based workshops and arts projects. Since starting in 1994 we have worked throughout the UK, across Europe and in the Middle East. 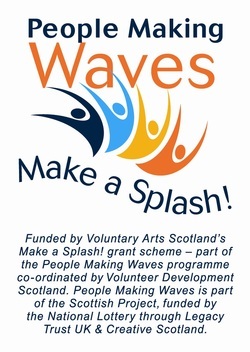 We are a registered charity based in Southern Scotland. Check their website and youtube site, folks, so cool! Can't wait to see you in action her with Cornbank Primary and on the street fair on the 3rd and then your workshop. Can't wait to have you here and get us all started! with a BIG THANK YOU to our funders!